Colleen Kelly was born prematurely on February 11, 1981 at 2 lbs 7 oz., and 9 months later she was diagnosed with Cerebral Palsy (CP). The doctors told her parents Dan and Michelle that she would probably never talk, walk, or have much function in her life. Today Colleen thanks them for challenging this. They saw her intelligent sparkling eyes and her great spirited determination as she would literally crawl a mile to build physical strength in a challenging program they placed her in during her early childhood years. At age 6, Colleen dictated short stories that her mother journaled. At age 10 she authored “The Land of the Leprechauns,” a children’s book published 4 years later of which thousands of copies were sold. Colleen not only overcame the adversity and challenges of being the 1st child with quadriplegia to enter her school system, she also functioned as a conflict mediator and received an Outstanding Achievement Award for all the positive effects she had on her school. 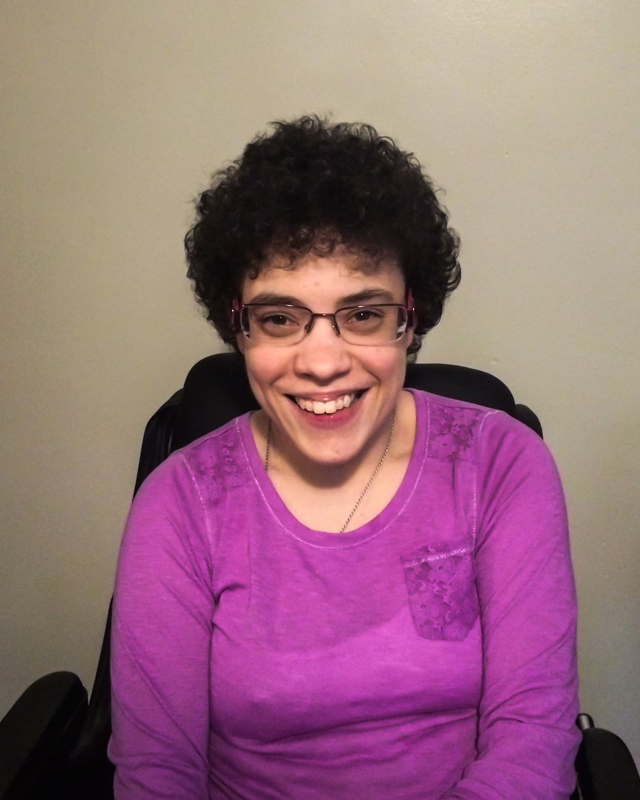 As a pioneer for so many individuals with physical disabilities, in her late teens Colleen volunteered for speaking engagements at various schools to talk to young children about what it is like to have CP, the pros and cons of her disability, and about overcoming adversity. She travelled to Columbus to advocate for the disabled and received the Youth Leadership Award from the Governor’s Counsel in Columbus, OH. With the help of student nurses getting her in and out of bed, and out of her dorm to the bus for classes, Colleen graduated from Kent State University with a B.A. Degree in interpersonal Communications, and a minor in Philosophy. Colleen’s thrives on connecting with and positively impacting the world. Her ability to reach out and share her life halted 2 years ago when the lift for her customized wheelchair broke, and soon after so did the family SUV. With spinal Harrington rods,(age15), she can only sit in a manual wheelchair for 1 hour before intense pain sets in. For the last 2 years, without her customized wheelchair, her “legs”, she has only been able to travel for very short visits. A new van will enable Colleen to attend, social outings, activities, medical appointments and speaking engagements. A spacious and functional van with a ramp and modifications made specifically for Colleen can cost upwards of $60,000! This is where she desperately needs your help with expenses to get back on the road again. To help offset such expenses, a fundraising campaign in Colleen’s honor has been established with Help Hope Live, a trusted nonprofit organization that has been providing community-based fundraising guidance to patients and their families for more than 30 years. All donations are tax-deductible to the full extent allowed by law, are held by Help Hope Live in the Great Lakes Catastrophic Illness Fund, and are administered by Help Hope Live for illness-related expenses only. If you would like to make a contribution, please click the DONATE NOW bar. Colleen, I worked with your dad years ago at AmeriWater and I just love both him and your mom. I am happy to donate to your cause. The picture of you is beautiful! Please give my love to your parents. Colleen you Rock! Happy New Year! When is the house warming party? Can't wait tI'll you can come vsit!... and stay!! !